Our product range includes a wide range of motorized gate valves. Leveraging on our in-house production unit, we are presenting a wide assortment of Industrial Motorized Valves. 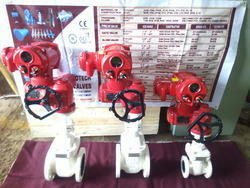 The offered valves are programmed for moving certain predetermined limits at the time of releasing pressure, thus helping in avoiding lot of industrial accidents because as well as also providing for improved safety processes. With the valves manufactured from quality carbon steel, alloy steel as well as stainless steel material options, these valves can handle temperatures from -20°C to 550°C as well as pressure from 0.20 to 700 Kg /cm2. Further, being cost effective as well as resistant to corrosion, these valves are made available in size range of 1/2" to 12" as well as set pressure of 0.20 to 700 Kg /cm2. Synchroset/synchropak flame proof/explosion proof available coupled with gears for quarter turn rotation.